November has been a busy month for historical performance at Chetham’s. This term’s Baronial Baroque concert took place on Wednesday 9 November in the school’s historic Baronial Hall. Chetham’s students performed a variety of works from the high and late baroque to a packed audience. The concert began with an evocative performance of Telemann’s first flute fantasia by Beth Stone on the baroque flute. Ethan Mitchell gave a spell binding performance of Rameau on the harpsichord, followed by a mature interpretation of Bach’s first Cello Suite by Levente Nagy, and Alastair Niven, in a truly virtuosic performance of Telemann. Works of chamber music followed, concluding in Bach’s beautiful fourth Brandenburg Concerto, directed by Dr Martyn Shaw. On Saturday 12 November, Chetham’s was represented again at the Royal Greenwich International Early Music Festival 2016. The Greenwich festival represents the world’s largest festival of early music. It is hosted each year by Trinity Laban Conservatoire of Music and Dance, bringing together musicians from across the globe, uniting performers, instrument makers and musicologists. This year’s festival took place at Blackheath Halls, just south of Greenwich, built in 1895 by William Webster. Chetham’s presented a recital of French and German chamber works from the late baroque. 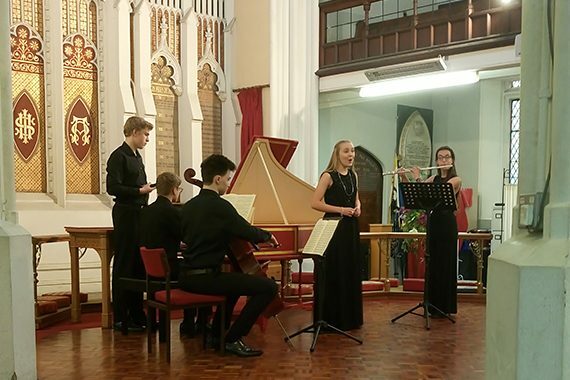 Highlights included Handel’s celebrated German Arias, performed by Katy Allan and Bach’s Trio Sonata in G Major BWV 1038. It was also a great opportunity to catch up with Chetham’s alumni, including Luke Challinor (leaver 2015). Luke is currently studying at the Royal College of Music, and was representing the Viola da Gamba Society at the festival. Elsewhere, on Friday 18 November, Chetham’s Recorder Consort visited Northenden Community Primary School, where they gave a performance of seventeenth-century dances. After the performance Chetham’s students assisted Dr Shaw in a baroque dance workshop with year 5 students.